The recipient of a mentorship award from the AAN and her mentee discuss how they work together toward building leadership skills. What makes a leader? Carlayne Jackson, MD, FAAN, asks herself that question a lot these days. A member of the AAN board of directors and a neuromuscular disease expert at the University of Texas Health Science Center at San Antonio, Dr. Jackson is involved in several new leadership programs that provide training and mentorship to AAN members. She said that encouragement was the first word that came to mind when she accepted the opportunity to serve as a mentor a few years ago. And then concern, compassion, listening, and even more listening. She has brought six mentees through these leadership programs. But Dr. Jackson is the first recipient of the Leading in Excellence Through Mentorship award, which was presented to the Texas neurologist at the AAN Annual Meeting in April. Dr. Jackson had never received any official training on how to be a mentor. But she has certainly been a leader throughout her own career — and she had not a lot of time to do so. In the last year of her neurology residency at University of Texas Health Science Center at San Antonio, Richard Barohn, MD, FAAN, encouraged her interest in muscular dystrophy and amyotrophic lateral sclerosis (ALS), and recommended that she stay on for a fellowship. Then, he moved to Dallas and she ended up running the Muscular Dystrophy Association clinic there — at age 28. But, she acknowledged, it was a stressful time on many levels. She was directing the clinic and at the same time was caring for her son who was born with a chromosomal deletion that led to myriad medical appointments. She learned quickly that what was needed for patients and their caregivers was a one-stop place to get all of the care they need. This led to the creation of the South Texas ALS Clinic that has been offering services under one roof since 1996. The encouragement from her informal mentor had lasting effects. She listened to his words and watched the way he worked with patients and their families. And along the way she picked up her share of leadership skills. Dr. Jackson has also participated in more formal types of training, including the Executive Leadership in Academic Medicine (ELAM) program, sponsored by Drexel University College of Medicine. She is an alumnus of the 2013 AAN Palatucci Advocacy Leadership Forum and has advocated for neurology issues to Congress. And most recently, she has been a mentor in the Emerging Leaders Program, Transforming Leaders Program, and the Diversity Leaders Program at the AAN. The AAN created the Leadership University to identify potential leaders and help identify their strengths and weaknesses and challenge them to become advocates. It has grown from two courses to 10 courses since 2013. Her work in the clinic and in the lab has offered her everyday opportunities to practice listening and encouragement. Now, she is giving back to younger neurologists, who are paving their own roads in the field. “We do not want anyone to feel alone on their journey,” she said, of the families she works with. She wants to challenge this new generation to pay close attention to the needs of their patients and continue to strengthen the practice of neurology. One of her mentees, Hope O'Brien, MD, FAHS, a headache specialist from Cincinnati Children's Hospital Medical Center, is already soaking up Dr. Jackson's advice and encouragement. They have monthly phone meetings and Dr. O'Brien traveled to Texas recently to spend time with her mentor. Dr. O'Brien was first paired with Dr. Jackson, and they set up a time to meet at the 2016 AAN Annual Meeting in Vancouver. Dr. Jackson was not what Dr. O'Brien expected as a mentor for the Diversity Leaders Program — she was tall, blonde, and from the South — but it didn't take long to realize how much they had in common. A sharp wit. Husbands that golf. A love of the brain and a passion for helping their patients. Within an hour, Dr. Jackson invited her new mentee to a private AAN reception, where she would meet many of the leaders in academic medicine. Dr. O'Brien said that Dr. Jackson was enthusiastic from the very first email she received a few days after she was accepted into the program. “I am honored to serve as your champion,” Dr. Jackson wrote. “I knew then that my experience was going to be life-changing,” Dr. O'Brien recalled. Dr. O'Brien's parents had immigrated from Jamaica so that their children would have a good education and better opportunities. She spent her childhood in New York City and then Florida. The 42-year-old neurologist is putting her ideas into action: She saw that her adult patients were having trouble managing their headache and migraine pain, and she realized that neurologists need to do a better job of taking care of headache in adolescents and young adults. She called her mentor to talk about how she could start seeing young people even though she trained in adult neurology. “This has been a missing piece of the management of headache,” she said. “For many people, headache begins early in life and we need to help people sooner,” she added. Dr. O'Brien said she found a strong voice through the program, and even proposed starting a Mentor of the Year award, adding that Dr. Jackson's name was written all over it. Her dedication in modeling leadership remains steadfast. “Being a mentor has taught me more about empathetic listening and having courageous conversations,” said Dr. Jackson. She said that her mentee is already showing her natural strengths as a leader in bringing her ideas to the Academy table; Dr. O'Brien is now a mentor in the Diversity Leadership program. “We wanted younger people to learn how to use their voice in the field and develop their ideas to make life better for their patients,” said Dr. Jackson. Most scholars accepted into the programs have been in academia, but the programs have recently started accepting neurologists in private practice, and the AAN has just started a leadership program designed for women. The nine-month training program culminates with the presentation of a group project. Dr. O'Brien's team identified ways to transform diversity problems in the profession. One of the ideas they proposed is to create mentorship programs between neurologists and minority students in high schools, including a clinical shadowing experience, to bring more diversity into the field. The group also suggested regional programs, summer prep programs for medical students, and research training programs to support diversity in neurology. Dr. O'Brien graduated from the University of Cincinnati College of Medicine in 2005 and remained there for a neurology residency. She was interested in adult headache and soon realized that understanding headache in adolescence might help in managing the condition throughout adulthood. She said now that she is trying to improve management of migraine over the life of the patient. She also has hopes of increasing the number of neurologists specializing in headache medicine. Dr. Jackson helped her to build self-confidence presenting within the academic community, she said. And since the program, she has signed on to do public speaking for a pharmaceutical company targeting migraine treatment. “I would never have done this before the program,” she said. Her mentor has also taught her how to welcome opportunities. The younger neurologist is following in her mentor's footsteps. She recently completed the 2017 Palatucci Leadership program. •. AAN Leadership University: http://bit.ly/AAN-leadershipU. •. AAN Leadership Programs: http://bit.ly/AAN-LeadershipPrograms. 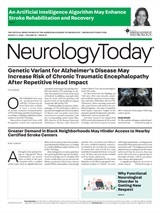 Neurology Today17(15):15-16, August 3, 2017.